This is one of the more exciting preps I've made in a while and is the ultimate waste-not product. As usual, me and the boys (Scott and Jason) are always talking about what we should make next, trying to make something the other's haven't made yet. Looking through the freezer, I forgot that I had a pig head in there from one of our pigs from last year and wanted to use that up sooner than later. 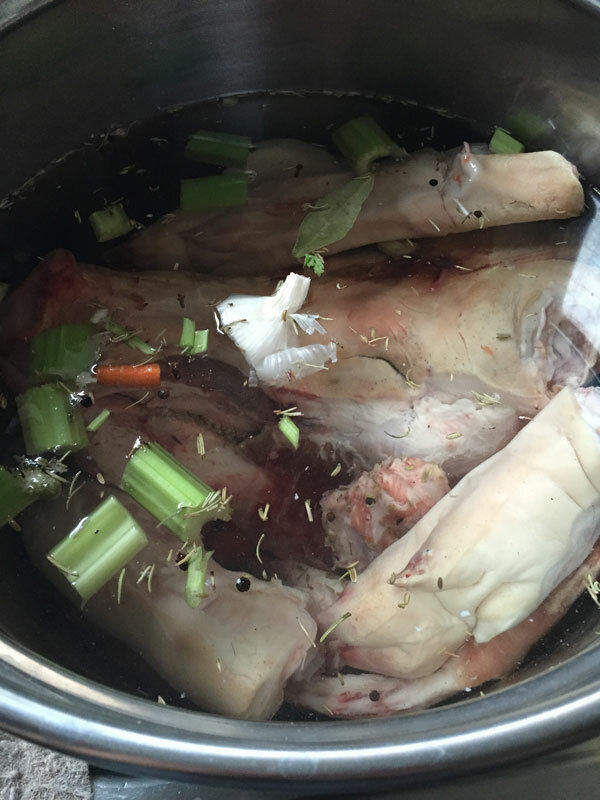 Yes, forgetting you have a pig head in your freezer may be the sign of a problem, I know this.Kate had told me about a prep she had in Tuscany, in which they basically threw every scrap into a big boiling pot and then poured it into a cheese cloth and let it set in the fridge. This prep is popular in Tuscany and called Soppressata Tuscana, not to be confused with the dry variety also known as Soppressata, but obviously very different. You'll find a number of different variations on Soppressata all over Italy, varying greatly by region, Soppressata di Calabria being one of the more popular ones. Having the head and other odd bits laying around, I began looking at the Tuscan prep and variations there of. The one I settled on was Biroldo (blood) della Garfagnana (region in the provenience of Lucca), which is a very old traditional preparation specific to that region.. Simply put, this is a head cheese of sorts with the addition of blood. Remove head from pot and allow to cool just enough so you can handle the meat to remove from skull. While cooling, continue to boil broth and reduce by 1/3 - 1/2. Add in spices, blood and broth and mix well. Myosin should begin to form on the bowl. Stuff mix into hog bladder or stomach using either a spoon or a stuffer. Take care to not break the casing, as if you do, you will have an absolute disaster of a mess. Place in pot and cover with water and the same spice mix as listed above for head. Poach in oven at 225 for 3 hours. Remove from liquid and place on cookie sheet or cutting board to cool. Place a cutting board or pan on top and weight down with enough weight to press. A couple of large cans of tomatoes would work fine. Remove, slice and enjoy. Anything that you will not eat in the next week or so should be vac sealed and frozen for later use.